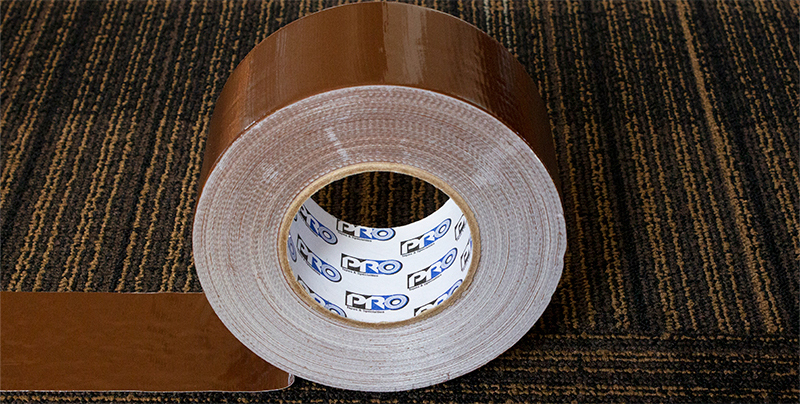 Pro® 120 is a premium duct tape that has been developed specifically for seaming carpet together. It adheres extremely well, is durable, yet removes cleanly; making application and removal a breeze. Pro® 120 is offered in a wide range of colors, so you can best match the tape to the most common tradeshow carpet colors for that seamless carpet look. Pro® 120 comes in standard colors such as, Tan, Burgundy, Black and many other colors. This product is also stocked in 3”x 60yds rolls. 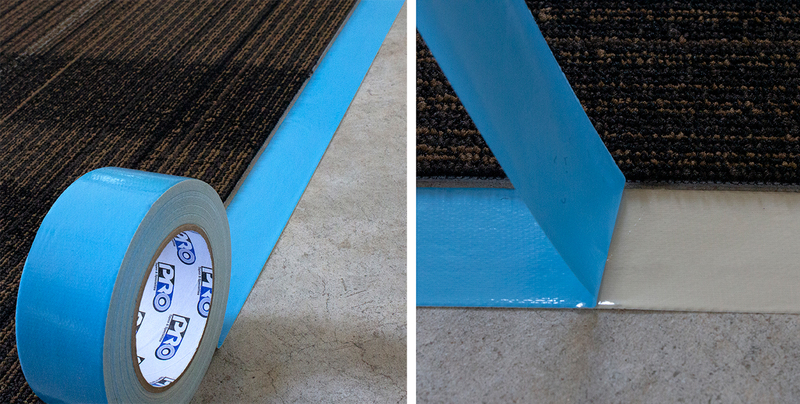 Pro® 500B is a double sided cloth tape with a blue poly liner used to secure carpet to the concrete convention floors. It is extremely high tack and can stick to dusty or rough surfaces. Even though Pro® 500B has an aggressive adhesive technology that can keep the carpet in place the ENTIRE show and then some, it will still remove cleanly from both surfaces when the tradeshow is over. Another feature of this tape is that the blue poly liner stretches when the tape is ripped at the desired length which lifts the liner off the adhesive a little, allowing for easy unwind and separation of the tape from the liner. Pro Gaff® is a premium matte cloth tape available in 19 designer colors that can work into any Tradeshow Exhibit. Pro Gaff® can either be discreet and blend in, or it can be high visibility with our 5 standard Fluorescent colors. These fluorescent colors are UV light reactive. So even if your exhibit uses low or UV light it can still be seen. This is especially important for safety, and marking areas visitors should avoid. It can also be used to color code your event or trade show materials, boxes and equipment for easy identification. Pro Gaff® is Standard in every color from ¼” to 4” wide to cover any application that you may have. 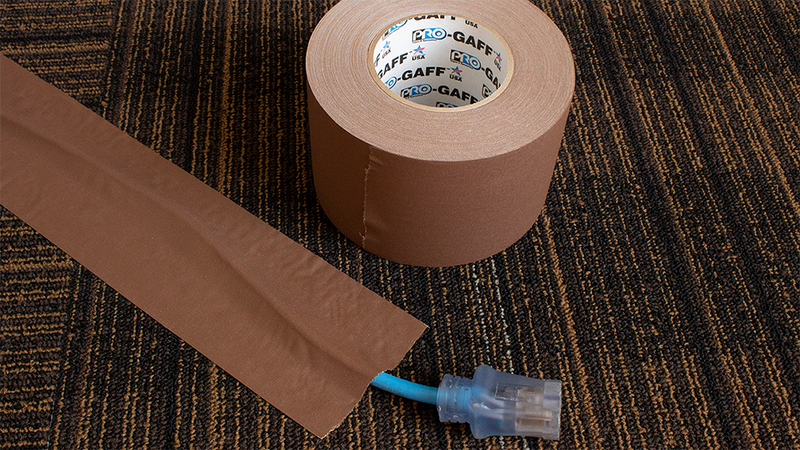 Pro Gaff® has high adhesion with our “SRA” adhesive system. It has high tensile or busting strength, yet removes cleanly without worry. Pro Gaff® can be easily torn by hand or cut with a scissor for any application or decorative effect. Pro Gaff® is also a workhorse for cable hold down . Since Pro Gaff® comes in 19 designer colors, removes cleanly from most surfaces, and has high adhesion, it makes for a perfect remedy to any cable disaster. Simply choose the color that best compliments your flooring, and affix those cable down. Not only does it allow for a sleeker and cleaner look, it also helps to avoid any potential hazards that may occur from having loose cables hanging around your booth. Cable Path® is a premium vinyl coated cloth tape that is coated on both edges with a premium cured rubber adhesive system. The center portion has a smooth surface for pulling cables and wires through. The high-performance adhesive will hold firmly for extended periods of time on most surfaces and removes without residue. Cable Path® is repositionable, hand tearable and has a matte surface for low reflection of light. It also comes in four colors, black, yellow, yellow printed black, and yellow safety stripes. 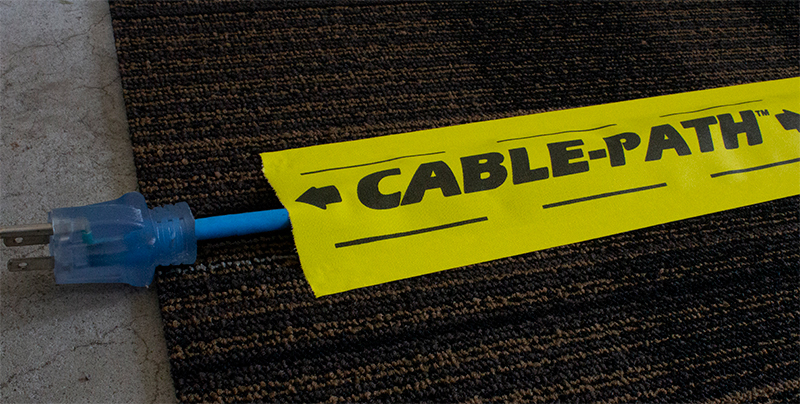 Pro® 120, Pro® 500B, Pro Gaff® and Cable Path®, may not be visible at every tradeshow but they are definitely there. These four tapes are necessities for any trade show or event exhibitor.